Transitioning from work to home is always hard, but it’s especially challenging when you work at home. That’s why an end of the work day routine is so important. Today I’m taking you through each step in my end of the work day routine, sharing why each step is important, and explaining how it can help you! My end of the work day routine used to go like this: stand up from desk (which was always covered with the detritus of the day), walk through the office door, and shut it behind me. My mind was still running through what did and didn’t get done, what I needed to do tomorrow, and I cringed at the thought of sitting down at my messy desk the next day. Needless to say, I wasn’t present with my family and was often downright grumpy! And not at all supportive! After too many “family” nights spent grumpy, stressed, and unfocused on my husband and kids, I decided something had to change. I started paying more attention, making notes, and completing research. The attention, notes, and research resulted in the end of the work day routine that I’m sharing today. This routine has made a huge difference in not only how I transition from work to family time, but also in my attitude, organization, productivity, and satisfaction with my work! Let’s take a look at each step in the ultimate end of the work day routine! To kick off your end of the work day routine, take a look at your calendar. That way you know exactly what’s going on the next day, how much time you’ll have in your office, how much time you’ll spend out of your office, and note any family happenings. This step feeds into the others and sets your end of the work day routine up for success! This step is usually quick for me. I take a quick peek at my calendar, make a mental note of anything important or out of the ordinary, then move on. My calendar is one of the hardest working organization and productivity tools in my business and my life! You can learn more about how I use my calendar and how I created a calendar routine here: Add Hours to Your Day with One Simple Tool. The next thing to do as you start winding down for the end of the day is to create a task list for the next day. Check in with your list from the current day, check off any items you completed, then transfer any remaining tasks to tomorrow’s list. I do most of this in Trello, so it takes me about 5 minutes. Although, if I have a hectic day or if it’s packed with tasks I want to complete, I’ll make a to-do list on paper. If pen and paper are more your style, here’s a printable for you to use for this step! Grab your Things To Do printable HERE! If you’re feeling overwhelmed and stressed because you didn’t accomplish anything on a particular day, try a 10-15 minute brain dump to get all of your tasks, projects, and ideas down on paper. This will help to lighten your overwhelm and stress and your brain will feel less cluttered. Learn more about how I use the brain dump technique in this post: 6 Tips for a More Productive Work Day! If you have appointments the next day, plan and prepare for them during your end of the work day routine. Complete any review or research necessary, so that the information is fresh in your mind for your appointment. Also gather any items you’ll need for your appointments and pack them in your bag, so all you have to do the next day is grab your bag and head out the door. This step helps to calm my monkey mind, which always revs up in the middle of the night. It also keeps my morning stress levels to a minimum, because I’m packed and ready to go no matter what time my appointment is scheduled. If there are any remaining items in your office inbox, process them. That way you start the next day with an empty inbox, which is a glorious feeling! These are just a few of the tasks that you might complete as you process the items in your office inbox. If having an inbox and inbox management process is new to you, this process may require more time. But as you complete this step regularly, it will get easier and faster! Having an inbox and inbox management routine is one of the most important things you can do to control paper clutter and keep your desk organized! Learn more about this important organization routine in this post: 3 Essential Routines for Home Office Organization. You can learn more about Action Files in this post: How to Use Action Files to Manage To-Do’s. Notice I didn’t say empty your email inbox…. Email inboxes are my Kryptonite! I seriously struggle to maintain them. However, I have found it incredibly helpful to deal with my email inboxes at the end of every work day. I’ve given up on inbox zero for now, but I try to keep each inbox to one page of emails. With only one page of emails in my inbox I can see everything that needs addressed with one glance, and I don’t have to worry about checking different folders for emails that need responses or actions. Whatever “email inbox management” means to you, commit to regularly completing those tasks as part of your end of the work day routine. If you’re like me and still trying to figure out email inbox management, pay attention to what works and what doesn’t during your end of the work day email time. Your preferred process will start to emerge, then you can tweak from there! So far, you’ve checked your calendar, made your task list for tomorrow, prepped for appointments, and cleared out both your office inbox and your email inbox. Phew! Anxiety inducing appointments, incomplete tasks, and inboxes full of more incomplete tasks might have you feeling frustrated, overwhelmed, or just plain stressed. This end of the work day routine can be challenging, and it often shines a spotlight on your unfinished tasks and projects. That’s why this step is so important! Take a deep breath, roll those tense shoulders, then make a list of everything you did get done. List every task you completed, no matter how inconsequential it seems. You’ve made it this far in your end of the work day routine, so you’ve already got 5 tasks you can write down: checked calendar, made a task list for tomorrow, prepped for appointments, and spent time working on office and email inboxes. Go, you! But don’t stop there! What else did you do today? Run a load of laundry? Open mail (even if it was only one item)? Take a phone call (or twenty)? Answer a text (or a hundred)? Note that you’re out of milk? Take a break during the day? Get some fresh air or sunshine? Stretch when you stood up from your desk? Write it ALL down, no matter how small it feels! We’re hard on ourselves. Not only do we expect far too much of ourselves, we often make impossible task lists then get frustrated when we don’t complete all of the items. When you make a Tah-Dah List include every. little. task. This helps to put a positive spin on your day, even if you started this process feeling frustrated because of how “little” you got done. Completing a Tah-Dah list at the end of every day will put you in a more positive frame of mind as you transition out of work and into your family time. Over time, it will also help you to gain a more realistic view of what you can accomplish in a day. Once you’ve listed all of the things you completed during the day, make note of anything that went well. Did you stop what you were doing when your kids got home and really listen to them? Were you more productive in the morning, the afternoon, or the evening? Take a few minutes to note what went well today. Noticing what went well during the day is a form of gratitude and by expressing gratitude you will start to notice even more things that went well and for which you’re grateful. 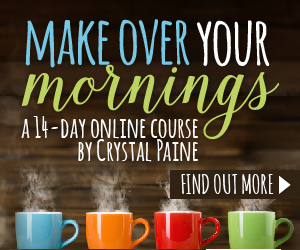 This is all about bringing more positivity to your day and specifically to your business! Although clearing your desk is the final item in this routine, it’s one of the most important steps (see the step above)! If you do nothing else at the end of the work day, complete this task! Or, if you’re just getting started with this routine, complete this one step until it’s a habit. Clearing your desk is a HUGE help in transitioning from work to home life, which can be a challenge when you work at home. And it will give you a fresh, energizing, clutter-free start the next day! I have my desk and office set up so that it only takes me about 5 minutes to clear my desk at the end of the work day. Put items away, develop a system for storing in-progress projects (I use a tickler file; learn more in Related Posts below), and get that work space cleared off! 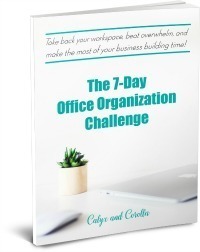 Get tips for setting your desk up for success (and quick clearing at the end of the day) by taking the 7-Day Office Organization Challenge! Learn more HERE! There’s always more to do at the end of the day, and there are always projects that are unfinished. That’s why having and end of the work day routine is so important. Completing these steps helps you to know where you are at the end of the day and exactly what needs to be completed the following day. And it highlights what you did get done and what went well, so that you can transition from work to home and family in a positive, happy mood! Complete this routine at the end of each day, and you’ll save time, be more organized and productive, and be prepared and ready to go when tomorrow begins! Here’s to ending our work days with intention and transitioning from work to home & family successfully!